Today (January 28th) is the 120th anniversary of Ethel May Martin’s birth – my great great aunt, to whom I am indebted with memories that helped power my early research into my family tree. Today would have been the 120th birthday of my Great Great Aunt Ethel May Martin. 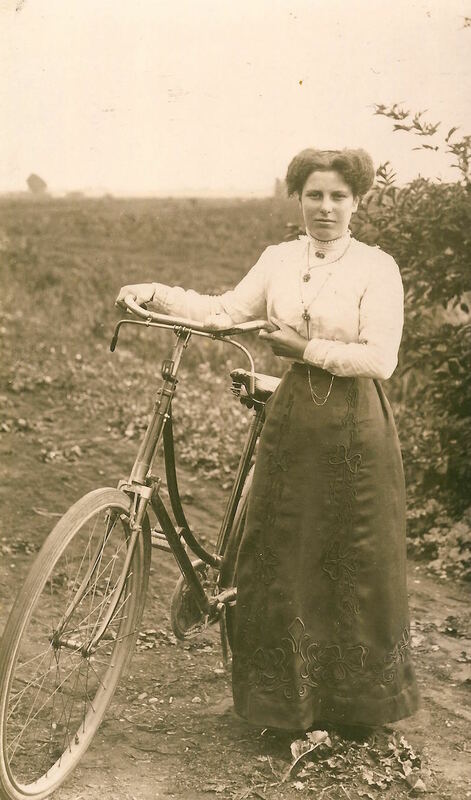 Ethel May Everitt (née Martin) with bike circa 1908. I sadly never met her, but her memories were able to feed in to my early family history research, via phone calls to my father’s uncle and my 1st Cousin twice removed, and verbally to my own uncle. She also had a huge box of family photos, stretching back to her own childhood, and a few of those family members from earlier generations. She died on 4th June 1999 at the age of 104. Ethel May Martin was born on 28th January 1895, in the fenland to the North West of the village of Little Downham, Cambridgeshire, England. She was the penultimate and eleventh child of railway platelayer, James Martin, and his wife Sarah Elizabeth Giddings. When she reached 101, she was featured in local newspaper, The Ely Standard. In their piece, she explained that she was born during a severe snow blizzard. “When I was born, my father had to walk through the snow storm to fetch the doctor”. The article also sees Ethel recall that ‘one of her earliest memories is playing in a garden with a skipping rope with her brothers around her’. In her working life, Ethel appears as a Domestic Servant in 1911, living at home on census night. She went on to work in domestic service in Littleport, Ely, and London, often alongside her older sister Rose, before returning to care for her elderly mother. Her first annual wage was £6. She also spent some time working as a fruit picker, before marrying Ebenezer Everitt on Christmas Eve 1931. Without Ethel’s memories, writings, and photograph collection, my family tree research may never have grown green shoots.